If you’ve ever wondered about the story behind the name of the band Cars, you might assume its members are car enthusiasts. But when you ask drummer David Robinson, who came up with the name, the answer is more layered than you might think. Perhaps even a Freudian slip for a kid from Boston who could’ve started out life as a car designer. “We made lists. One of the names I made up was ‘the Cars,’ and we thought, ‘It’s really easy to remember, it’s short, it comes at the beginning of the alphabet.’ It had nothing to do with cars. Totally random. I was at a point where I hadn’t thought about a car for years and years and years,” Robinson says, laughing. The Cars catapulted to rock stardom at the beginning of the New Wave music movement in the late 1970s, selling more than 23 million albums, and the band was inducted into the Rock and Roll Hall of Fame this year. At the height of the Cars’ popularity around the world, the person who came up with the band’s name did not own a car. Even so, Robinson is still interested in cars today: “Every time I see a new car, I immediately redesign it in my head,” he says. Robinson admits choosing the word for the band’s name might’ve been a reflection of his subconscious. “It’s fun that I’m finally being asked about cars. Nobody’s ever asked me about my car or anybody’s cars, from the beginning of the band,” Robinson says. Over the years, music journalists have asked the band about their name. “They would ask who made it up, and does it mean anything, and we would just say abruptly, ‘No,’” Robinson says. Today, Robinson is far from the stage lights. He lives a simpler life on the coast of Massachusetts with a view of the ocean. He’s an artist, an abstract photographer, and a gallery owner who sells jewelry he makes. He does not own a cell phone, only has a landline, and drives a 2003 Volkswagen Passat W8 wagon—which was a very purposeful decision. Robinson rates the Passat high on a scale of 10. “Since I just spent $15,000 to restore it, it’s now a 9,” he says, laughing. “The frame rotted out. I’d been struggling to keep the car because I love station wagons and manufacturers have cut back on station wagons, so there’s not much to offer. Styling-wise, it looks really nice and it was in good condition.” Part of the restoration was removing the rust that had occurred since the car is parked near the ocean. “It’s fast—it’s really fast,” Robinson adds. Robinson didn’t need a car until he was in his 30s, since he took the subway in Boston. He’s also owned three other wagons—two Mercury Sables and a Ford Taurus. “I got those because when the Sable first came out, it was the first streamlined, nice-looking station wagon. They were still making boxes up until then,” Robinson says. 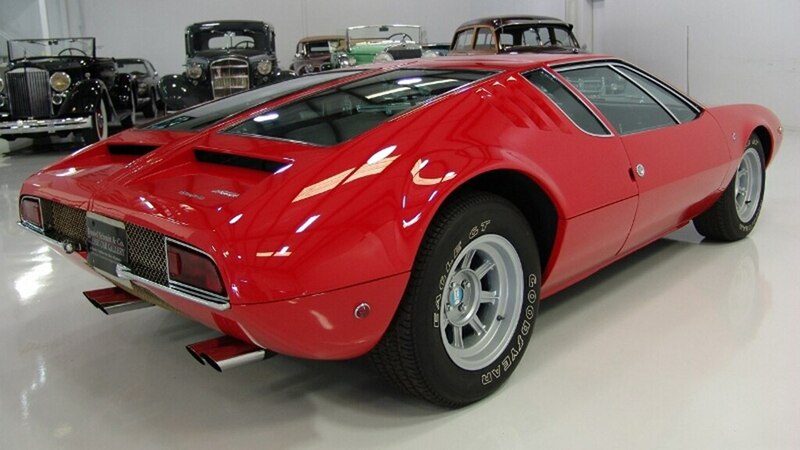 Robinson also owns a dream car he never even thought he would have—a 1969 De Tomaso Mangusta that’s being restored by Wayne Carini, of Chasing Classic Cars fame (watch episodes on Motor Trend Premium right here). Robinson transformed his first car—a 1962 Mercury Comet woody station wagon—into a band car. He learned to drive around the streets of Woburn, Massachusetts, in that Mercury. The Comet was the first new car Robinson’s dad bought. “It turned out to be a horrible lemon, and he went through hell to get Ford to fix it. He went up to the state house to complain, he wrote letters to Henry Ford complaining about it,” Robinson says. Robinson says his father was trying to get Ford to give him another new car. “It drove him crazy. I’d like to think that people like him were responsible for those lemon laws coming into place,” he says. Robinson drove the Comet when he was in the high school band. “I decided it was getting run-down-looking—the fake wood was peeling—so I painted the light part of the fake wood to match the car, which was green,” he says. He made a professional-looking sign for a band he had then, called The Rising Tide, and stuck it on the side window. “It looked incredible, but it caused a commotion on the street. It was so bizarre; people beeped and screamed. My father was so excited because it got all this attention from young people, so he thought he was hip,” he says. Three times, people left notes on the Comet to ask where they could get it done to their car. “We just laughed. My father was more excited about it than I was. I think my mother was in shock. I only had the Comet for a few more months. I was over at the band’s practice house in the winter, and we heard this giant crash. We looked out the window, and a drunk driver going 50 mph rear-ended it. We went outside and couldn’t find it because it flew through the air over a snow bank. The guy survived, but the car was perfectly, evenly crushed like an accordion,” Robinson says. By late 1978, Robinson was in the Cars, but he wasn’t looking for a car to fit his new rock star life. 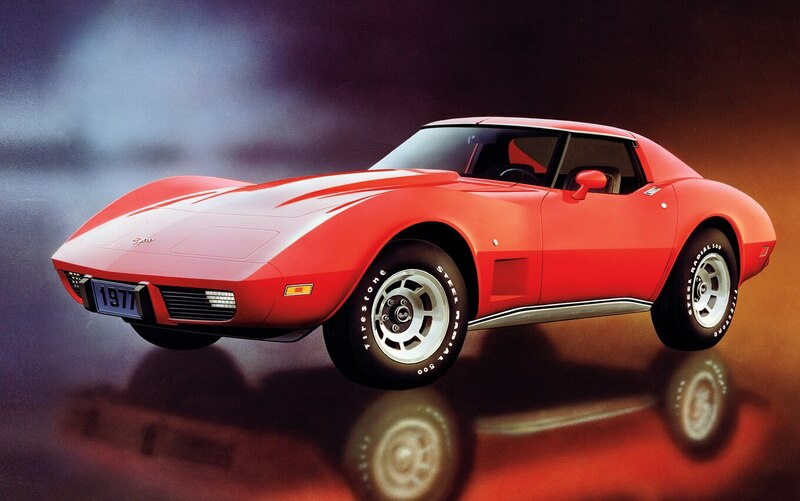 He just happened to buy a 1976 Corvette on a whim because a girlfriend’s father, who worked in Detroit, called her up and asked if she wanted his secretary’s company car (a 1977 Corvette is shown above). Robinson hardly drove the ’Vette. 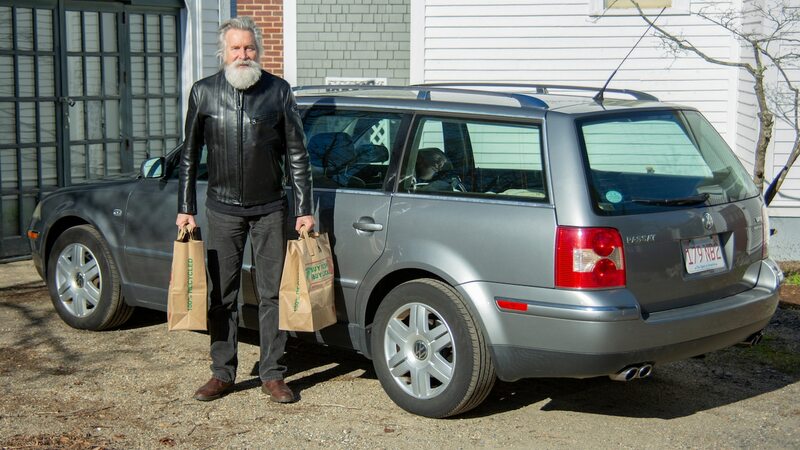 “I would use the band’s van because it was parked in an indoor garage a block away from where I lived, so I never really needed a car until I moved from Boston in 1986, and then I got into the station wagons,” he says. After the interview, Robinson drove the Corvette back home, three blocks away, where he got lucky to find a parking space in front of his door. He went in to wrap Christmas gifts and came out two hours later to find the car no longer there. “It had just started to snow and there were fresh tracks in the snow. Somebody was really determined to take it because there were people all over the street,” he says. Since Robinson took public transportation in Boston, after the ’Vette, the Cars’ drummer was carless until his mid-30s when he moved to the suburbs. When Robinson was in another Boston-based band called Modern Lovers, they drove across the country to record an album. 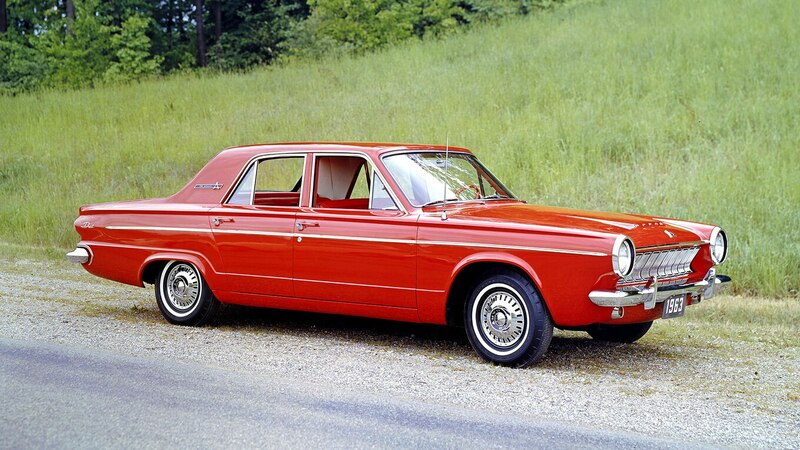 They took the road trip in a 1963 Dodge Dart and the band’s van, which had the bass player’s BMW motorcycle in it (a 1963 Dodge Dart is shown above). They took this road trip in the early 1970s, driving from Boston to Los Angeles, New Orleans, and back home. “The trip was incredible because I had really never left Massachusetts and I had never seen any of the natural wonders,” Robinson says. 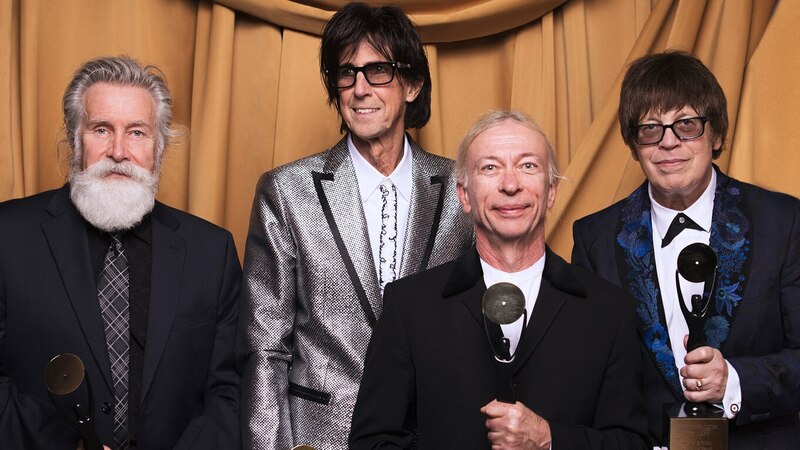 The Cars were inducted into the Rock and Roll Hall of Fame earlier this year, after being nominated twice before (photo above is courtesy of the Rock and Roll Hall of Fame). Two years ago Rhino released two new digitally remastered box sets of the Cars’ catalog, with extra material and artwork. 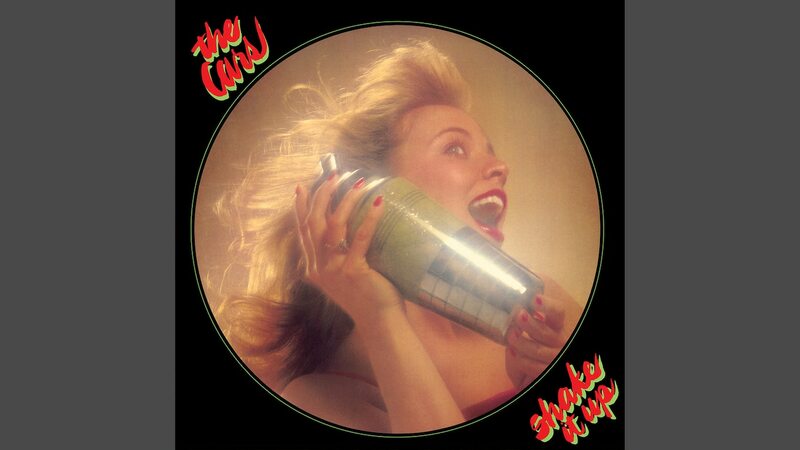 This year, in honor of the band’s induction into the Rock and Roll Hall of Fame, the label released expanded editions of the band’s most iconic albums, Shake It Up and Heartbeat City. Robinson was always the art director, designing the band’s album covers. Robinson was recently given the gift of being able to go back to 1984. Or at least, with the Rhino releases, redo the album covers, including the one for Heartbeat City. The post Celebrity Drive: The Cars’ Drummer David Robinson appeared first on Motor Trend.